I.SO 9001,ISO 14001 and SGS (RoHS). 2.In the stage of SIEF. ISO 9001,ISO 14001 and SGS (RoHS). In the stage of SIEF. Properties: it has strong water absorption. It can almost dissolve in all the solvents. (1) As solvent of poly(1,1-difluoro-Ethene); or electrode's accessory material of lithium ion battery. 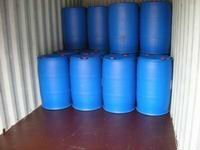 Packing:galvanization drum/baking paint drum or plastic drum. Net weight is 200kg/drum; 1000l IBC;ISO Tank.